Nowadays I am working on a project that consist of Raspicam and several devices in Raspberry pi 3. 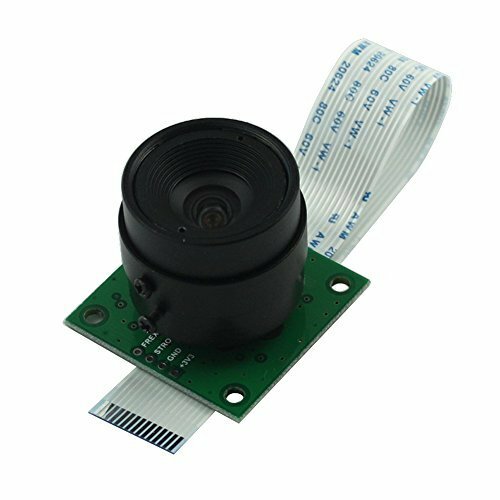 According to process, I need to make a clear image for video stream and therefore I am looking for a cheap, modular and compatible lens for RaspiCam. I just would like to increase 6 cm resolution to 30,40 cm. You could look at clip-on lenses designed for use with smartphones. Those are more likely wide and telephoto fixed lenses rather than zoom. You could also hack the zoom lens from an old compact camera. Last edited by PiGraham on Fri Aug 10, 2018 3:30 pm, edited 1 time in total. PiGraham wrote: You could look a tclip-on lenses designed for use with smartphones. Those are more likely wide and telephoto fixed lenses rather than zoom. Thank you for your answer, It is exactly what ı need. Also I would like to ask another question, Is there any way to make a digital zoom in Python for Raspicam? The CS mount is the standard for CCTV/Security cameras, so there are lots of lenses available on the market, including some with motorized zoom, etc. You can even get adapters from CS-mount to C-mount or SLR-type mounts, but those lenses would likely be overkill. There have been various mentions about using the low cost mobile phone lenses which, as pigraham pointed out, have the spring clip to hold it to the camera board. I share other people's reservations about the discomfort in having that very strongly sprung clip fixed to the board so I've been looking around for a mounting block that can take the thread of those mobile phone lenses (approx 17mm) or an adaptor from M12 to these. Do they exist? I am going down the M12 lenses route too but wondered if I can use the various mobile phone lenses I've picked up too? I also have a 63mm F2.7 macro-focusing lens in C-mount. And one used to be able to get 25mm F1.0 lenses. Is there any way to make a digital zoom in Python for Raspicam?